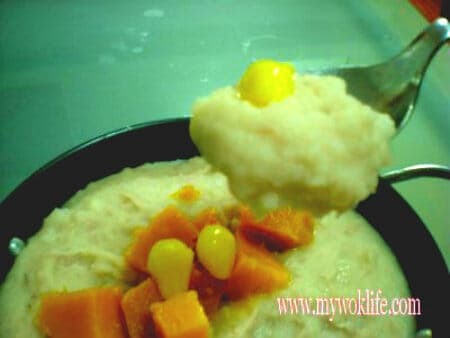 Sweet yam paste is a famous traditional Teochew dessert. This dessert dish will be served at most Teochew restaurants in Singapore. 1 regular portion of sweet yam paste dessert costs about $5 – 6. Price is expensive! So, how about give it a try at home? 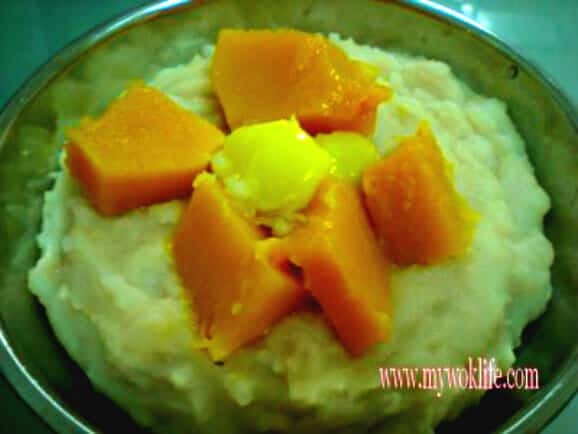 Try my sweet yam paste recipe here. Sweet Yam Paste might look complicated to make, but it is not so difficult in fact. Taste might be as good as restaurant standard, much more the hearty feeling to your loves one, with a homemade yam paste! 1) Bring a small pot of water to a boil. Add the taro pieces and pumpkin pieces, boil for 10 minutes, or until the pieces are thoroughly cooked and tender. Remove from pot, let the taro and pumpkin pieces cool separately. When pumpkin is cool, cut it into small cubes, and reserve for garnishing purpose. 2) Return to the cool taro, use a masher or big fork to mash the taro completely smooth. Heat a wok over medium fire, and add in olive oil. Add shallot and fry till fragrant. 3) Then, add in mashed taro, and stir continuously with wooden spatula, until the taro and oil are well-combined. Reduce heat to low fire, gradually add in water and keep stirring it till taro paste becomes smooth and paste-like consistency. 4) Add sugar and coconut milk, stir for 5 minutes. Sprinkle some corn flour, and stir for another 5 minutes. Heat off, and serve in a nice serving dish. Garnish with ginkgo nuts and pumpkin cubes. Serve warm. This yam paste can be used as the filling of bun or puff, if you wish to make yam bun/ yam puff. Calorie of a decent portion of yam paste counts 350 – 400kcal. Tips: Taste your yam paste while cooking, increase the amount of sugar if sweeter taste is preferred. * The texture of Teochew yam paste should be thick. If you prefer more watery consistency, add more water when cooking, continue to stir till well-combined. * You may also choose to add more coconut milk as garnishing when served. Alternatively, add olive oil on top of the yam paste to feel the smooth texture in the palate. i can’t believe this is done so easily! i love this v much! anyway, can you tell me which brand of coconut milk is good for this this? and the yam erm… regular = roughly how big? ok last Q!! what is shallot? Is it garlic? You are most welcome to load me qns ya! 1) I like to use the ready packet type instead of those placed in the chilling shelves. It might be fresher and nicer, but harder to store, while the ready packet one can be stored at room temperature before opened. So, I use Ayam Brand packet coconut milk. 2) Size of yam: Length abt 7″ and diameter abt 3″. When I stated regular, I meant an average size among those yams you could find in the basket/ box/ shelf at supermarket or wet market. 3) Shallot is small red onion. (小葱头). Those very small onion normally used for cooking chili/ curry or fried ones which you top it on your soup noodles as gasnishing.. Hawker food seller e.g. Ban Mian will always put one..
this looks great. i think it’s tasty also. woah thanks! :) I’ll be back to let you know if I succeed! :)!! Hi, would like to know what is the purpose of using shallots and will there be a difference if the shallots are removed from the oil? To put the shallot just to get some fragrance of it. Just need to extract a little frangrance by frying it in the oil, then remove it as I do not need too strong flavour from it. This fragrance makes the dessert not just in sweet taste, but mixes with some fragrant scent and taste, I personally like it alot. Hi there, possible to convert from cups into grams? need some hlp .. sry to ask u .. what is “½ clove of shallot” in chinese ? Shallot is small red onion – (小葱头). Sometimes, 1 small shallot will have 2 or more cloves in it when you peel the outer layer of skin. So, just take 1 of the cloves and use only half of it and thinly slice the half clove for use. In Chinese, it should be called – (半瓣小葱头). haha..this is simple but if u wanna try the restaurant standard is not this kind of recipe..cuz it takes quite long to do it to make it more fragrance and smooth..
I’m currently making some but I’m concerned about how to reheat it later at night or for tmr morning. Do u know how do I store the ornee after I make it? Do I freeze it? And how do I reheat it? Thank u! There are 2 simple ways to reheat your yam paste even if it is refrigerated. 1) Steam to make hot.